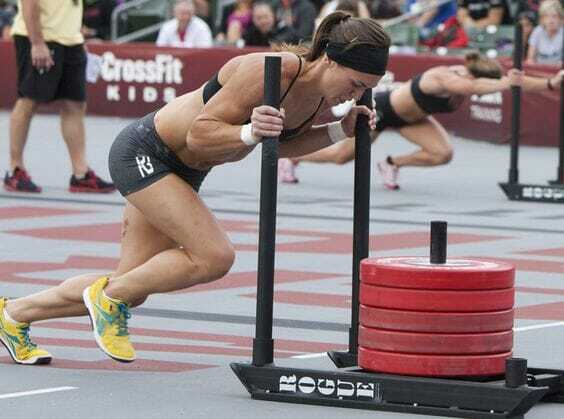 →CrossFit Soreness – All Pain and No Gain ? CrossFit Soreness – All Pain and No Gain ? CrossFit Soreness - we've all been there! It can be excruciating especially if you have not worked out in a while. So what exactly causes it and how can we help to reduce it? If your previous experiences in a gym were casually moving around from machine to machine or watching television on a treadmill or exercise bike then chances are you muscles are probably not really ready for their first few sessions at CrossFit. Make no mistake about it CrossFit is not for the meek. You are expected to work hard and put in the grind. When you end up pushing yourself on unfamiliar exercises you might just find that you are sore all over, and in some cases in muscles you didn't even know you had. What is CrossFit Soreness ? The soreness that you experience when trying CrossFit is called DOMS. DOMS is the common abbreviation for Delayed Onset Muscle Soreness. DOMS is generally a result of using your body in a manner that it is not accustomed to. For example say you haven't worked out in quite a while now go do 5 sets of 20 push-ups. Chances are your chest and triceps are going to be sore the next day. This soreness is generally what people refer to as DOMS. Although it is different for everyone DOMS will generally start to appear somewhere in the range of 18-24 hours after you workout. Keeping the intensity down for a few sessions allows your body to adapt to the new stress that you are placing it under. A lot of the time you will see a CrossFit trainer really pushing their new trainee's in a very aggressive manner right off the bat. This is a massive mistake and is the sign of a bad coach. If someone has signed up for a 6 week challenge at your gym then they should be eased into it in the first week. By all means don't make it too easy on them. If you really want them to still be there and enjoying it at the end of the 6 weeks then ramp the intensity up over the first two weeks. This can be tricky however as not everyone will be at the same level initially and some people may find it too easy. Striking a balance is key, enough effort to keep everyone challenged in some way but not so much that it ends up crippling the least fit. Dehydration is said to intensify the symptoms of DOMS so just like the best athletes in the world you need to keep adequately hydrated. Plain cold water is more than sufficient to sip on during your workout as it is the easiest on your stomach. There really is no need for sports drinks of any kind, most are nothing more than water, sugar and some flavoring. After your sessions you can employ some light stretching. Stretching can help to increase blood flow to your muscles once they have cooled down. The increase in blood flow even if it is light can help to flush out toxins and lactic acid from your muscles. Aim to get at least 8 hours of sold uninterrupted sleep every night. Although few people regularly get this. It should till be something that you aim to do every day. Sleeping is when out body repairs itself. Do fit people get DOMS ? Just because you consider yourself or someone else an advanced CrossFitter doesn't mean they are exempt from getting DOMS. Train in extremes of temperatures that they are not used to. The chances are however that when you do something like CrossFit for long enough and vary the amount of different exercises that you do regularly you probably won't fall foul of DOMS that often. Some of the fittest people out there have learned to listen to their bodies and they no when to back off and when to go really hard. This kind of intuition is something that is developed over time. Copyright text 2018 by Crossfit Survival. CrossFit Survival is a participant in the Amazon Services LLC Associates Program, an affiliate advertising program designed to provide a means for sites to earn advertising fees by advertising and linking to Amazon.